In order to preserve the value of your timepiece, it is important to regularly service it (every 3 years) and to respect its instructions for use, as with every fine precision mechanism. 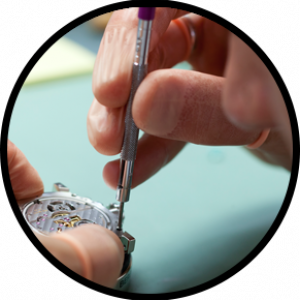 With a mechanical watch, regular maintenance of the movement is essential to ensure a long service life; the mechanism must be lubricated on a regular basis, which is why we strongly advise you to have your watch checked professionally once every 3 years. To protect the movement against moisture, make sure that the winding or setting crown is pushed or screwed in fully against the case flank. We also recommend that you remove the watch from your wrist when you pull out the crown to alter the time. This avoids lowering its water-resistance. The seal is required to protect the movement from both dust and damp. While you can indeed swim with a water-resistant watch, the water-resistance guarantee lasts only two years, after which the seal may deteriorate and thus result in costly and extensive damage. DeWitt watches benefit from an after-sales service that meets the highest technical quality standards of Swiss Haute Horlogerie. Watch maintenance should only be undertaken by an accredited DeWitt after-sales-service centre. Any maintenance that has not been carried out by a DeWitt after-sales-service centre is excluded from any guarantee coverage. This also applies to the use of spare parts that do not meet the quality standards set by DeWitt.